In the early 1970s television writer Larry Cohen turned to independent production, writing and directing low budget but high-concept horror pictures. Several have endured as cult hits. For It's Alive Cohen came up with the squeamish concept of a killer baby, whose traumatized father cannot bring himself to help destroy it. God Told Me To is about an extra-terrestrial being that compels people to commit irrational acts of violence -- they're convinced that they're following the will of God. Cohen's daring ploy in these pictures is to carry social and spiritual taboos out to their logical finish. Unlike conventional horror shockers, they don't avoid the ideas inherent in the morbid subject matter. In 1981 Cohen was hired to write and direct the Mickey Spillane adaptation I the Jury. When he tried to work in his own footloose style, changing things as ideas and opportunities arose, he was fired. In creative retaliation, Cohen put another independent show together in just a few days. 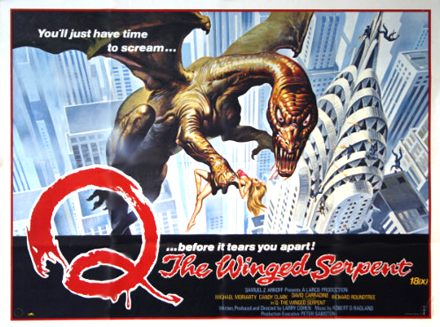 Q The Winged Serpent opened day and date with Jury and did much better box office business. Cohen's movie (actually given the on-screen title "Q") is an energetic spin on a horror subgenre that went out of favor with the 1950s -- it's about a giant monster running amuck in New York. The average 1950s monster show was for kids, who would sit patiently through reels of dialogue scenes to enjoy a few minutes of a cool monster, or some interesting special effects. Larry Cohen's movie inverts that recipe. The monster effects deliver some good jolts, yet are barely adequate overall. The movie around the monster is terrific. This is perhaps Larry Cohen's best picture, thanks to a great script and good acting, especially that of the wonderfully funny and criminally underrated Michael Moriarty. Q succeeds where the old monster movies fail: by integrating the monster into the story. Habitual criminal, part-time musician and loser's loser Jimmy Quinn (Michael Moriarty) is temporarily off the drugs and booze. He isn't aware that New York is seeing a wave of inexplicable killings - a variety of victims are being plucked from high-rise rooftops -- bathers, window washers, etc. Jimmy can't get a job playing piano, so he hires on as a getaway driver for a bank heist. He botches that too, losing the money and almost getting run over in the street. Fleeing his partners, Jimmy climbs to the vert top of the Chrysler building -- where he finds a nest with a giant egg! Roundtree: "You're not making any sense. You say the window washer lost his head how?" Carradine, losing patience: "I don't know how! Whaddaya want me to say? Maybe his head just got loose and fell off!" When Jimmy hears about the mystery killings, he realizes that he's in a position to hold up the city for a million dollars -- only he knows where the cops can find the killer monster. Detective Shepard pressures Jimmy to divulge the location of the monster nest as a civic duty, but he shifts his extortion scheme into full gear, over the objections of his girlfriend Joan (Candy Clark). What none of them realize is that the monster is related to another string of grisly killings, in which the victims seem to have volunteered to be flayed alive. Clearly having the time of his life, Michael Moriarty plays Jimmy Quinn as if the role were going to net him an Oscar nomination. It should have, as the character is one of the best 'New York' characters ever. Jimmy limps around in ratty clothing with a perpetual addled look on his face, as if still unbalanced by the drugs and his time in stir. He's a whining loser proclaiming himself the eternal victim. Amused to see the city dancing to his tune for once, Jimmy turns into a manic joker, merrily goading the mayor and the two detectives with jibes and taunts to compensate for his own miserable inferiority. The acting brilliance rubs off, as both David Carradine and Candy Clark have some great scenes with Moriarty. Clark tells him off in one overheated domestic tangle, while Larry Cohen stages perhaps his best scene ever in the extended faceoff between Quinn's opportunist extortionist and a pack of irate cops and curious city executives. Quinn knows where the monster lives, and negotiates a tight deal to profit from it. Larry Cohen slips some pointed commentary between the lively characters and the genre-twisting plot. A museum contact tells Detective Shepard about the bloody sacrifices of ancient Aztec priests and their God Quetzalcoatl, a legendary 'feathered flying serpent'. An Aztec cult believes so thoroughly in their 'dead' religion, that they are willing to sacrifice themselves to it, in nauseating horror. Of course, they're nuts, Cohen's wicked point is that their crazed zeal is as legitimate an expression of faith as that encouraged by modern, authorized churches. Perhaps more legitimate, as the bloody sacrifices seem to have resurrected a bona fide monster deity. Convincing and surprisingly witty action distracts us from the absurdity of a monster that can avoid detection while flying around Manhattan in broad daylight. The sight of the giant egg in the skyscraper loft is appropriately chilling. Cohen delivers several big BOO! 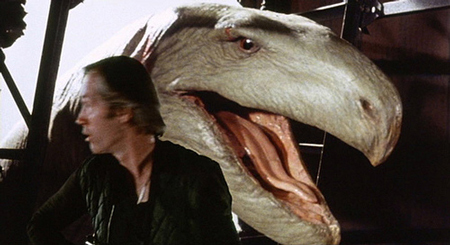 moments, with the flying serpent suddenly bursting onto the screen like the shark from Jaws. Jimmy Quinn becomes a funky cheerleader for a squadron of New York's finest, as they swarm into the Chrysler building's rafters to ambush the monster. In true Cohen fashion, a series of angles of noble warriors taking positions is undercut by a shot of one of them chugging a beer. Larry Cohen put Q before the cameras so quickly that he didn't stop to consult an effects company until after his shooting was finished. Stop-motion animators Dave Allen and Randall William Cook were hired to come up with a full effects job with no time and less money. The animation model is well designed, but some angles are rather literal and flat, especially side views dictated by the aerial back-plates filmed over New York City. But there are many clever and ambitious angles, and some with quite delicate animation. Q's snake-like head pulls a number of cops out of work buckets, and either rips them up or lets them fall 50 stories to the pavement below. 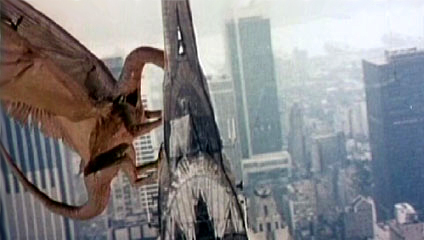 A few shots do appear to have been filmed under the direction of the effects men, especially a nice angle on the wounded monster struggling to hang on to the roof of a building. Animator and optical specialist Peter Kuran provides exciting animation of tracer bullets showering Q with lead in spinning aerial angles. Kuran may also be responsible for some traveling mattes that place the Quetzalcoatl puppet behind the live-action actors. Larry Cohen surely received several times the value of his meager effects budget. Shout! 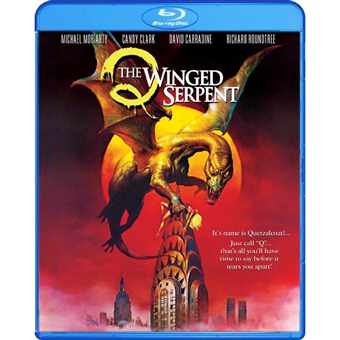 Factory's Blu-ray of Q The Winged Serpent can boast a fine transfer of this film. We were expecting the added resolution to reveal more rough edges, but the cinematography doesn't suffer and almost all of the effects look better than ever. By 1982 Ray Harryhausen had retired from filming, and his stop-motion magic was all but a 'Lost Art'. Films like Dragonslayer were few and far between. Q bravely carries on the tradition. The improved sound gives Cohen's location dialogue additional clarity. We're told that Michael Moriarty wrote and performed his own piano music for the movie, and it sounds better than ever. An original trailer is included. Larry Cohen's feature commentary is a very good listen. He discusses his rapport with his actors and his predicament coming off the career debacle I the Jury. Cohen is proud of the way he took advantage of opportunities to make the picture better. He was initially denied permission to film in the upper gallery of the Chrysler Building but eventually got his entire crew up in the confined spaces. According to Cohen working the location was a scary experience -- the inside of the building's famous facade has dozens of large openings without safety rails. Cohen praises his effects people but misidentifies David Allen as a contributor to the Lord of the Rings trilogy. That was Randall William Cook, who earned three consecutive Oscars as a director of special effects animation. The talented and accomplished David Allen passed away in 1999, at age 54. Supplements: Trailer, Larry Cohen commentary.